In today’s look at the national news of 1962, Roadtrip-'62 ™ will compare some of the news of today with news of that year. We also looked at some headlines in our post 5 National News Headlines from 1962. Big recent headlines have involved United States immigration policy, the Federal budget, passenger train crashes, mass shootings, and our ongoing military actions around the world. So, how do each of those situations compare to what happened in 1962? Annual immigration into the United States was actually very small in 1962, with only about 280,000 people admitted, compared to over 838,000 fifty years earlier. The 1962 figure was only about one-fifth of the 2016 figure of 1.49 million immigrants to the United States. And the number of foreign-born persons living in the country was also much smaller around 1962. Figures for 1965 (the closest I could find) state that only 5% of the population, or about 9.6 million people were foreign-born, compared to 13.5%, or 43.3 million in 2015. This is a huge increase, so it is not surprising that many people feel it has changed the whole of American society and culture. It is also just barely below the peak of 14.8%, which was reached in 1890, when the country still had the buffer of sparsely-settled lands in the west. The biggest immigration concern around 1962 was with people fleeing the newly Communist regime in Cuba. When Fidel Castro’s rebels overthrew the Cuban government in 1959, many Cubans moved to the United States in what they originally thought would be a temporary exile. By 1962, 119,922 people had arrived. Because of Cold War concerns about Communism, most Cubans who arrived were admitted under special humanitarian provisions citing Communist oppression in Cuba. These people were primarily of Cuba’s elite and maneuvered through the immigration system well, obtaining immigrant, student, and tourist visas, or entering the United States indirectly through countries such as Canada, where they applied for US visas. Also, about 14,000 unaccompanied minors arrived in the United States in 1960 and 1961 through a US program known as "Operation Pedro Pan.” In 1966, Congress passed the Cuban Refugee Adjustment Act, which formally allowed a legal status to both new immigrants and those already present in the United States. 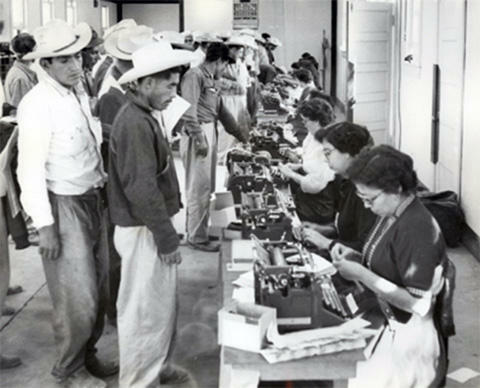 Besides the end of the Bracero Program and the amnesty for Cubans, other changes were on the horizon for immigration laws. The 1962 Migration and Refugee Assistance Act, which took effect the next year, provided that the United States would admit 1 refugee for every 4 who were accepted by the rest of the world in any one year. A companion bill permitted 23,000 non-quota aliens to enter from countries with oversubscribed quotas, split with 7,000 as skilled specialists and 6,000 as close relatives of US citizens, the beginning of chain migration. By 1965, the Hart-Celler Act repealed the national-origin quotas altogether and initiated a visa system for family reunification and skills. The federal budget of 1962 was a record peacetime budget and at $101.3 billion, Congress became known as “the first $100 billion Congress”. It topped the previous year by $5 billion but was less than President Kennedy requested because foreign aid was cut, a $5.7 billion request for public schools was denied, and the Medicaid proposal was not passed. Congress sent more money to defense than the President requested, and spent nearly $1 trillion on infrastructure projects. They also raised federal employee wages almost all across the board. Congress also refused to establish a new Department of Urban Affairs and Housing. It should be noted that eventually, this new department was created, along with the Medicaid program and heavy expenditures of federal dollars for education throughout the states. By 2017, federal expenditures for health care, such as Medicaid, would account for 25% of the budget! Even back in 1962 the deficit problem was recognized by the Chair of the House Committee on Appropriations, Representative Clarence Cannon, “We are continuously and consistently spending more than we take in, much of it for non-defense purposes, and loading it on our grandchildren and their children’s children.“ Depending on which method was used in calculations, the 1962 fiscal year came in at a deficit of between $4.5 and $6.3 billion. History has shown that Representative Cannon was correct: the 2017 budget deficit was up to $666 billion, about 100 times that of 1962! And the total accumulated public debt is now $14.7 Trillion, which, assuming there will even be an attempt to pay it off, will last long into our grandchildrens’ childrens’ lives. 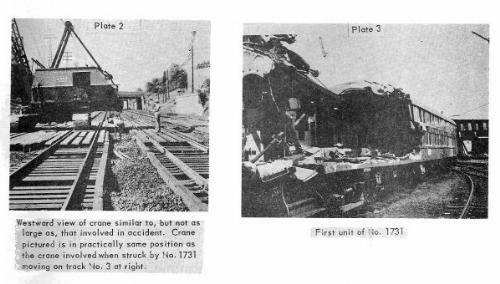 Passenger train crashes have been in our news lately, and things were no different in 1962. Serious passenger train crashes were not rare worldwide, with one in Iran killing 49 people, one in Columbia killing 40, Romania had 32 fatalities in one incident, and Yugoslavia 24. There were also six deadly crashes in the United Kingdom (Great Britain), two in Italy, and single incidents in Japan, Netherlands, Argentina, France, Poland, and Mexico. Here in the United States, there were the following six accidents worth noting. In May, 16 people were injured when a freight train derailed in Ravenna, Ohio due to a broken spring in a gondola car. The freight train hit a passenger train heading the opposite direction as it derailed. Video shows some of the aftermath and cleanup beginning at 4:21 in. In March, the wreck of the North Coast Limited at Granite Lake, Idaho killed just 2 people, the engineer and fireman of the train. Apparently due to human error in determining setting of brakes for a curve, the lead locomotive left the tracks at between 75-80mph, tumbled through the air, slammed into some flat land below, and finally slid into a lake. Fortunately, this action caused the rest of the train to hit the curve at lower speeds, so the passenger cars slid to a stop without falling into the lake. The train's brakes were of a type that needed to be "set up" well in advance of reduced-speed zones, and this was a 30mph zone. There was an "advance warning reduce speed" ahead of the curve but too close to have any significant effect if the brakes had not already been prepared properly. As a result of this crash, the whole segment of track through this area was rebuilt in 1965 with gentler curves. In June, another crash occurred for the North Coast Limited, this time at Evaro Hill in Montana. This crash unfortunately involved just about the worst in human error: both the engineer and fireman were drunk. This resulted in both men falling asleep, missing a required brake check and speed reduction as the train began coming downhill after reaching the summit under high throttle. The train speed increased to 87mph when it hit a curve that was supposed to be only a 30mph curve, resulting in four diesel engines overturning and careening down an embankment, dragging 15 of the train's 17 cars with them. Fortunately, only one person died, though 219 of the 350 passengers were injured and required hospital treatment. The worst train wreck in the United States in 1962 was the Baseball Special that derailed near Steelton, Pennsylvania, which killed 19 people. Another 119 were injured when five train cars jumped off the track and the two cars that were carrying passengers landed in the Susquehanna River. Initial rescue work was largely done by volunteers who were first on the scene, and was somewhat hampered because the tracks were electrified and there were sparks flying. Some of the bodies were so mangled they had to be identified from fingerprints. The train was a special run to Philadelphia, taking fans to a baseball game. Later that evening at the game, a moment of silence was observed at Connie Mack Stadium for the crash victims. The game went on, with the Philadelphia Phillies beating the Pittsburgh Pirates, 9-2. In August, there was a collision at Woodside, New York between a pile-driving crane and a passenger train on the Long Island Railroad. This resulted in the death of one passenger, and the injury of 31 passengers and 7 railroad employees. Railroad employees were the only fatalities in a train-truck crash in Chandler, Texas in November. In this incident, a freight train hit an oil tank truck, which exploded and further caused one of the six locomotives to explode. Three members of the train crew died, though the truck driver escaped with only second degree burns. Interestingly from a modern-day point of view, there were no mass shootings in the United States during 1962…or for at least the 20 years before that! In fact, the first mass shooting of the post-World War II era was a few years later, in 1966. In the first mass school shooting of the modern era, on August 1, 1966 Charles Whitman climbed to the top of an observation deck at the University of Texas-Austin and shot and killed 16 people and wounded another 31. But fifty-eight of these mass shootings have occurred since 2006! Today, we seem to have one of these tragedies about every month, so what’s different? Were guns outlawed in schools back then? No, in fact there were really no legal restrictions against bringing a gun to most schools, other than normal concealed carry laws. There were actually a few incidents of someone bringing a gun to a school and shooting a single person, as a result of some personal argument. Were there armed guards in schools to cut short an attack? No, most schools did not even have any unarmed guards and literally anyone could walk onto campus and wander around the buildings at will. Were the guns significantly different? No, there have been semi-automatic “machine guns” available for public purchase since at least 1921, with the most famous being the “Tommy Gun” preferred by gangsters during the Prohibition era. I strongly suspect that what changed was us, society, the culture. Back then, if you had some grievance against an individual or even the world at large, you simply never thought of shooting a mass of random people at a school. It didn’t even occur to the insane, which you can argue is the mental state of every mass shooter. Somehow, sadly, the world is so complex today, and fame is so instant and pervasive, that madmen can make the illogical connections that they should take out their problems on the world at large and they will achieve a lasting place in society for doing so. On January 12, 1962, the first United States combat troops arrived in Vietnam. By the end of the year, we would have around 10,000 men on the ground in an effort to halt the advance of Communist guerrilla fighters from North Vietnam, who were estimated to control about three fifths of the rural areas of the country by the end of 1961. In effect, we had decided to prop up an ineffective and perhaps corrupt South Vietnamese government that a large part of the population did not want. Internal divisions in South Vietnam were actually quite evident even at the highest levels, for example when the country’s own air force bombed the presidential palace in February. But in the grip of our fears of the expansion of Communism, we would not recognize our mistake for another decade, after the deaths of tens of thousands of American soldiers. Besides Vietnam, we also sent troops to nearby Thailand. Their purpose was to help the Thai army secure their border with Laos, which was experiencing internal strife as various factions tried to take over the government. Unlike today, when we have troops stationed in over 130 countries, back in 1962, we were active in very few countries. Of course, we still had forces in Europe, stationed in both Germany and Italy since the end of World War II in 1945, and also in Japan on the island of Okinawa since that same date. We had troops in Korea since the end of the Korean War in 1953. Additionally, the United Nations had troops in the Belgian Congo, but I could not find whether US troops were part of the force. The force came from nineteen member nations, so it is likely we were involved. This seems to be the only country where the United Nations had troops during 1962. That’s it for US Army involvement around the world in 1962, and this is it for today’s installment of Roadtrip-'62 ™. Hope to see you soon for more!